Many designers, curators, and editors have long made the argument for fashion as art, but Winnipeg-based Métis artist Jaime Black has taken things one step further with the REDress Project. 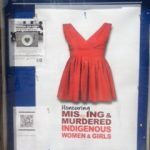 For nearly a decade, Black has been hanging hundreds of red dresses on campuses and public sites in cities across the country, a visual reminder of the estimated 1200 missing and murdered Indigenous women in Canada. 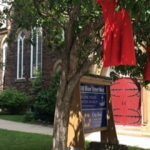 Earlier this summer BSUC joined the conversation with a REDress installation on site at 300 Bloor Street West (a joint initiative with Church of the Redeemer and Trinity-St. Paul’s). The signature pieces in shades of scarlet, vermilion, and ruby, were obtained through community donations (a tradition since the very first installation in 2011) and “evoke[d] a presence through the marking of absence” (an excerpt from Black’s artist’s statement). According to the Native Women’s Association of Canada, Aboriginal women are almost three times more likely to be killed by a stranger than non-Aboriginal women, and nearly half of these cases remain unsolved. In 2016, the federal government launched an independent national inquiry into missing and murdered Indigenous women and girls (MMIWG) with the goal of creating a safer environment and shining a light on the truth through artistic expressions like the REDress Project. BSUC was proud to take part. 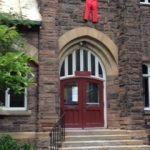 For 130 years, the church’s mission has been to create safe and welcoming environments, and a space to support the community. 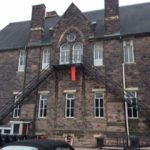 The crimson flags that hung in the courtyard this summer were a reminder that this mission is still relevant today.